Do You Need an Audio Visual Operator? 30 Dec Do You Need an Audio Visual Operator? If you are planning an event with an audio visual element to it, you realise pretty quickly that an extra pair of ‘safe hands’ wouldn’t go a miss. Someone to run the video, make sure the projector is working, adjust the sound, check the batteries and so on – these people are known as audio visual operators and this post will give you some insight into what AV operators do and if you need one. 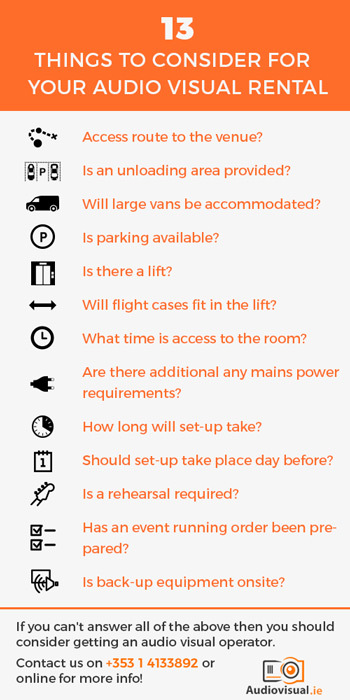 What does An Event AV Operator do? The role(s) of an AV operator are many and varied. The big advantage of booking AV technical services is peace of mind. Whilst there is an additional cost consideration, a single ‘techie’ or a team of AV professionals can make the difference to your event. A good AV technician keeps one eye on the end result and one eye on the clock. An experienced AV Technician will keep a cool head under deadline pressure or in the case of a technical crisis. Planning is everything. Assuming all AV equipment is taken care of, here are some less obvious considerations when it comes to audio visual rental (and determining whether or not you need an AV operator). Access route to the venue? Is an unloading area provided? Will large vans be accommodated? Is parking available? Are stairs involved? Will flight cases fit in the lift? What time is access to the room? Are there additional any mains power requirements? How long will set-up take? Should set-up take place day before? Has an event running order been prepared? If your event is smaller – say a 2 speaker PA, a couple of wireless mics and a display (projector or flat screen), an operator can ensure everything is delivered and set-up on time and that everything works the way you want it to. The operator will advise on best practice i.e. location and size of the display, speaker positions, suitable background music etc. Don’t trade minor budget savings for large increases in risk and potential for failure. A simple example would be the number of wireless microphones. If there are five presenters, rent five wireless mics. Don’t try and get away with two, planning on “swapping them out” between speakers. All you’re doing is increasing the likelihood of something going wrong. If you have any questions about whether or not your audio visual rental merits having an AV operator then feel free to get in touch and we’ll be able to advise. Give us a call on +353 1 4133892, contact us online or email me directly ivan@audiovisual.ie. Pingback:Video Wall Hire - Make A Big Impact! Pingback:Wireless Headset or Lapel Microphones? A Quick Guide!